The women of La Malvada Mujer are brilliant. They make the stuff that I really wish someone made, which is totally convenient. Today, that includes these two holy piercings, one by an arrow (spear?) in the heart, one in the rib. The big dark vinyl X tattoos come with arrow attachments, and suddenly I am on an episode of Buffy. The arrows matched this beautiful skin that you can't have yet, because Ugly Duck hasn't released it yet -- it's coming out on October 1st. This skin more than any others of her line seem to suit my lips: the makeup is lush and cupid-bow and perfect. The hair is a splendid, overwhelming confection from DBS, the Sweeny. The partner likes me red-headed, so I wore the rusty one for her. Violet Voltaire's jewelry never fails to make me happy. 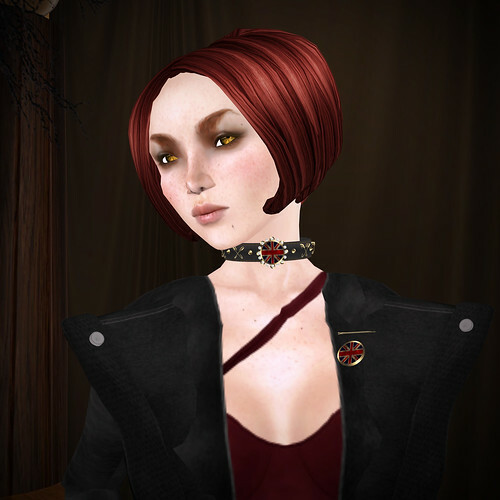 She's made a set for the latest Black Bacchanal, and it makes my geekpunk heart happy to see the safety pins and British flags… It comes in earrings, a pin for one's jacket, bracelets, and a neck cuff. My outfit and shoes today are from Royal Blue. I'm so happy to see Marni creating again. Her dress is unique and carefully made, and I love the asymmetry of the top strap. The color is a surprising match to the sleek Mrs. Andrews bob from Frou Frou, which is (of course) at Hair Fair.